This topic can be applied to any distribution and not only to NuTyX. It explains how to compile and install a customized kernel, should you wish to do so. They are many reasons to compile your own kernel. One good reason would be to reduce the size of the kernel as much as possible and optimize it for your own hardware. This will greatly speed up the boot up process. The sources are downloaded into your personal folder. After a few moments, a new prompt will come up and the sources are in place. 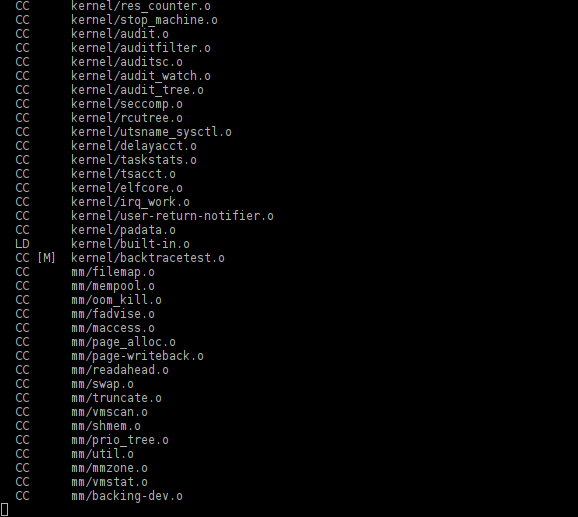 To be able to compile the kernel, we need to be in the kernel directory. We are now ready to launch the magic commands. It will give you ALL the possible options for compiling the kernel and its modules. That's just the beginning of the list! . Let's start by making sure that the sources are clean and don't contain any compiled parts. This command needs to be carried out only once. After the first build, you can skip this command if you need to recompile the kernel. There should be no messages printed. We will now launch the configuration tool and activate as few options as possible for our working kernel. I have chosen the non-graphical interface on purpose, so that you can do it in a chroot, a graphical terminal or a normal terminal. In this article, I have chosen only the options which are needed for a successful boot. It means that the number of modules will be very small. You have to know that a generic kernel contains more than 5000 modules. Once you have completed your selections, choose the option Exit repeatedly until you are back at the prompt. A new message will ask you if you want to save your configuration; choose the default option Yes. The compilation will start. If you have more processors or fewer, adjust the value -j4 to the number of cores you have. A few minutes (or hours) later, ... you have a kernel ready to be used. We just have to add the right entry into the configuration files grub.cfg of grub 2.0 or, if appropriate, in menu.lst of grub 0.97. And that's it! This way, you will still be able to choose when booting up which kernel your NuTyX should be running.